About Athens City Card/Pass: The Athens City Pass gives tourists the privilege to explore and discover the full ancient city of Athens. With the city pass, tourists get free access into the state of the art Acropolis and its museum, they get a 2-day ticket to go on the hop-on-hop-off tour to see the iconic spots in the city of Athens. This gives visitors/tourists the ability to save on other centers of attractions and museums. The Athens City card allows tourists a fast entry into the Acropolis with an English speaking tour guide. This pass generally offers an advantage for tourists who do not want to see everything in Athens, but for those who intend to explore just the highlights of Athens; the Greek capital. The card also comes with another major advantage, it is not restricted to 24 or 48 hours, but for 72 hours, it comes with a transfer to and from the airport. You also get to decide what, where and when you want to visit any of the highlights in Athens. Want to know the best part? You get your city pass sent directly to you for use on arrival at the airport. Mini train throughout Piraeus with attractive discounts! 20% Discounts, and many more! You get a Free Map & Brochure with important information about the places you want to explore. Transport Options: There are different options of transportation to explore if you are considering this tourist vacation in Athens, and they include some of the following such as unlimited metro rides from/to the airport, mini train, and bus. The Athens Mini City Card/Pass does not cover public transport in the city (except CLASSIC & COMPLETE). So it is best you book your City Pass early to get the benefit on arrival at the airport up until the moment you depart. You can decide on the days you wish to go sightseeing or visit the historical monuments and places in Athens, either on weekends or during weekdays whichever works for you. Validity: The Athens city pass is valid for up to 72 hours of free unlimited travel when you get the Classic or Complete ticket categories. This means free hop-on/hop-off transport in Athens, and also from/to the airport. 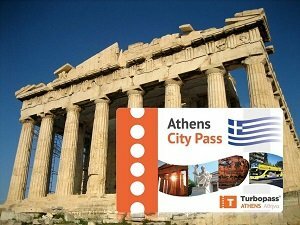 What Are People Saying About Athens City PASS (Reviews)? Reviews are a great way to enlighten people more about what works and what doesn’t. These reviews come in handy for people who have not used or purchased any city pass before but intend to do so. According to a user by the name Veronica from Uruguay, she acknowledged that the Athens City Pass offers “excellent! mobility and walks”. Another review from Marcelo, a Brazilian stated that it is “practical” and that “it worked very well for what was proposed”. While Catherine from France state that, it is “very practical, essential not to queue at the Acropolis!”. The Athens iVenture Card is another way to visit world famous and top attractions in Athens. With this pass, you get the privilege to enter over 40 top attractions in Athens and also skip the daily long lines the most important sights and museums in the city. So if you are planning to see the Acropolis and museums such as the Benaki Museum, you get to skip the long queues at the very busy attractions. This card also gives you the opportunity to see the Delphi, a 24 hours Cruise to Three islands even with a limited budget. Enjoy the hop-on-hop-off double-decker open bus tour with 50% discounts when you go to shops, restaurants, and other top attractions. The best part of it is, you get to choose out of 3 different passes; the Athens Flexi Attractions Pass, the Athens Unlimited Attractions Pass, and the Athens Museum Pass as you create your own itinerary of experiences. The Athens Flexi Attractions iVenture Card is one of your passports to see top attractions, go on tours, visits museums and build experiences in the city of Athens. You can save a whopping 40% on the number of attractions and tours you wish to embark on, which could either be 3, 5 or 7 top attractions and tours with other amazing experiences in Athens. Since it is your holiday, you get to pick the top attractions you want to see and other things you wish to do in Athens. This card is valid for 5 days, which you can utilize to create your own list for your sightseeing pleasure. With the Athens Unlimited Attractions iVenture Pass, you get to enjoy about 37 top attractions and tours in Athens. This is a full bouquet of attractions for you to choose from. These unlimited attractions pass is an all in one pass to all the top attractions in Athens with 50% off cruises, museums, open bus tours, sightseeing and many more! You get an option of 3,5 or 7 days to see as many attractions and enjoy your moments consecutively from the time you start using this pass. This pass is valid for 6 months from the date of purchase, so if you want to see it all; then this Athens Unlimited Attractions iventure Pass is a sure thing. Athens Museum iVenture Pass gives you access to the top museums, galleries and experiences the culture of the Greek capital Athens. It is not possible to visit Athens without a visit to the worlds famous Acropolis and its museum (the Acropolis museum). Learn about the country's historical background when you visit 8 other museums, enjoy Greek plays, dancing Ssow or you can also take a run around the Panathenaic Stadium which happens to be the first stadium of modern Olympic games. From the moment you start using your pass, you get 3 days consecutively to visit all the many attractions in Athens. You get to enter 3, 5 or 7 top attractions, tours and experiences of your choice in Athens such as the Athens Open Tour Bus, Acropolis Museum, Segway tours, Day Cruise, Delphi Day Tour just to name a few! See the Athens city and its surrounding areas such as the Delphi, Cape Sounion, and Aegina. Entry into over 40 top attractions, tours and experiences of your choice in Athens such as the Athens Open Tour Bus, Acropolis Museum, Segway tours, Day Cruise, Delphi Day Tour just to name a few! You get entry into about 14 top historical and cultural attractions of your choice in Athens such as the Acropolis Museum, Athens War Museum, Panathenaic Stadium, The Ghika Gallery and many more to choose from! With your 3-day pass, you to visit places at your own pace and create your own experience. The Athens iVenture Card comes with airport transfers. Free walking tours with skip the line at famous museums to further explore Athens. With the iVenture Card, you get up to 50% discounts and special offers at selected shops, restaurants and attractions in Athens. How Much is a 1/2/3 Day Athens iVenture Card? This pass only admits one. Below is a list of the top attractions, museums, and restaurants you get to see depending on the type of card you choose. Tours and Top Attractions: Athens sightseeing with Acropolis museum, Delphi full day trip Epidaurus, Mycenae full day tour, Athens Hop on Hop off bus tour, Cape Sounion Temple of Poseidon, Sunset Cape Sounion tour, Poros - Hydra - Aegina full day cruise, Ancient Corinth Daphni Monastery half day tour, Mythology walking highlights tour, Acropolis/Parthenon Archaeological site, and the delicious Athens food tour Panathenaic Stadium. Top Athens Museums: Acropolis and the Parthenon, Acropolis Museum, Benaki Museum of Greek Culture, Museum of Cycladic Art, Athens War Museum, Islamic Art Museum, Toy Museum, Benaki Museum of Ghika Gallery, Museum of Greek folk instruments, Natural History Museum, Spathario Museum of Shadow Theater, Museum of Ceramic Art, Ilias Lalaounis Jewelry Museum, Hellenic Motor Museum, and Frissiras Museum. The Athens iVenture Card is a way to get you accustomed to the Athenian capital. With the iVenture card, you get numerous options to choose from depending on how you want your itinerary to be like. With tours, walks, sightseeing adventures where you can hop-on hop-off the open top double decker buses, bike tours and many more. You also get a day cruise explore the Acropolis, cool off at cafes and restaurants and also shop for presents for your family and friends all at discounted rates. Is The Athens iVenture Card Right for Me? This Athens iVenture Card is right for you and your family because it covers a whole lot and you get to choose from a wide range of the best top attractions to visit at your own pace. You get to pick 3, 5 or 7 top attractions and tours you wish to see. With this card, you can also choose if it is only museums you wish to visit or all the top attractions in the Greek capital city Athens. What's even more interesting is the fact that you get to plan your sightseeing adventure to suit your time as you gain more knowledge about this historic city. Isn't it just amazing? 1. Benefit of the card: Athens Tourist Tickets are designed to offer tourists unlimited travel throughout the city at an affordable cost. These tickets offer a lot of flexibility as well as affordability since there are several different options available so you can pick a ticket according to the time you plan to spend in the city. The 3 day ticket also includes two trips to and from the airport by the metro or airport express bus. 2. Transport valid: All tourist tickets in Athens are valid for use in bus, tram, trolley, suburban rail and metro. 3. Card price and validity: The 24 hour tourist ticket costs €4, 3 day ticket costs €20 while the 7 day ticket costs €14. 4. Online purchase: Tourist tickets in Athens can be purchased at the yellow and blue ticket offices and at railway stations, tram and metro stations throughout the city. 1. Benefit of the card: Athens Spotlighted Card has been specifically designed for foreigners visiting the city. This discount card allows visitors to enjoy discounts at dozens of museums, theatres and attractions in the city. Additionally, it can also be used at restaurants, shops and for many other services. 2. Attractions valid: Athens Spotlighted Card is eligible for use at dozens of participating attractions. The list includes theatres such as the Greek National Opera, Pallas Theatre and Hellenic Cosmos. It also includes museums like the National Gallery, Benaki Museum and Numismatic Museum. 3. Card price and validity: This discount card is available free of cost to foreigners. The card is valid for 10 days from the time it is first validated at any of the participating venues. 4. Online purchase: Athens Spotlighted Card is not available for online purchase. It is only available at the Eleftherios Venizelos Airport and can be picked up at designated booths in the airport. 1. Benefit of the card: Athens Spotlighted Card is a discount card for foreigners visiting Athens. With this card, you will be able to enjoy special menu offers or discounts of 20% off the entire bill in dozens of restaurants in the city. The card allows a party of 8 to dine at some of the best restaurants any day of the week. 2. Restaurants valid: This discount card is eligible for use at dozens of restaurants in the city. The card can be used for a party of not more than 8 people and can be used 7 days a week. The website offers an updated list of all participating restaurants.